According to an ancient Jewish proverb, “The rivalry between scholars advances wisdom”. With that in mind, I would like to bring it to you that rivalry in football will advance the game. I am referring to the rivalry between managers. The tone of a club is set by the manager as many a player will attest to, and with close media scrutiny and social media exposure, the fans are getting ever closer to the dressing room to find out. At a grassroots level, Manchester and Liverpool have a deep-seated enmity that dates back to the Industrial Revolution and it has continued to this very day. The need to achieve glory, goals and greatness sums up the two towns. Under the reign of Sir Alex, it was Red versus Red in the battle for footballing supremacy while my beloved Blues spent enough time battling for their survival with closes rivals Macclesfield Town. Life and football are both fluid and the war has continued with Manchester City taking up the mantle and charging forward. So in 2015, we encouraged a rivalry that began in Germany with the arrival of Jurgen Klopp at Liverpool. Maybe Pep Guardiola decided he wanted to try and defeat his nemesis when he took over as manager of Manchester City in July 2016. Pep won both the Premier League and the Carabao Cup last season. He has won other competitions many times including the Champions League, Spanish Cup and German Cup twice. He was both Spanish and German champions three times over and has won a host of other trophies I didn’t know existed. I wonder if he came to Manchester City with the hope of redressing the balance when it comes to his Achilles heel. You see, in 14 meetings Jurgen Klopp has claimed eight victories and with one draw, that means Pep has only five victories against the German-born enigma. A surprising statistic, and his worst record against any one single manager. Let me take you back to those early clashes. It is never easy when a new boss comes into town but Pep is as heroic as you get, so surely he will take the Bayern side, who were triple winners, to another victory in the German Super Cup final. With a heroic header from Marco Reus, the attacking game was on. His passionate fast-paced second goal sandwiched a Daniel van Buyten own goal and a belter from Ilkay Gundogan to seal the deal. What was exciting was the match itself. With Arjen Robben’s brace, we had two great teams lead by inspiring managers. And so, a rivalry was born with Klopp chalking up his first victory on Pep’s debut match. What is exciting about this rivalry is its dignity. Both managers focus on their own team’s performance and can concede defeat with grace and dignity- well, in public at least. 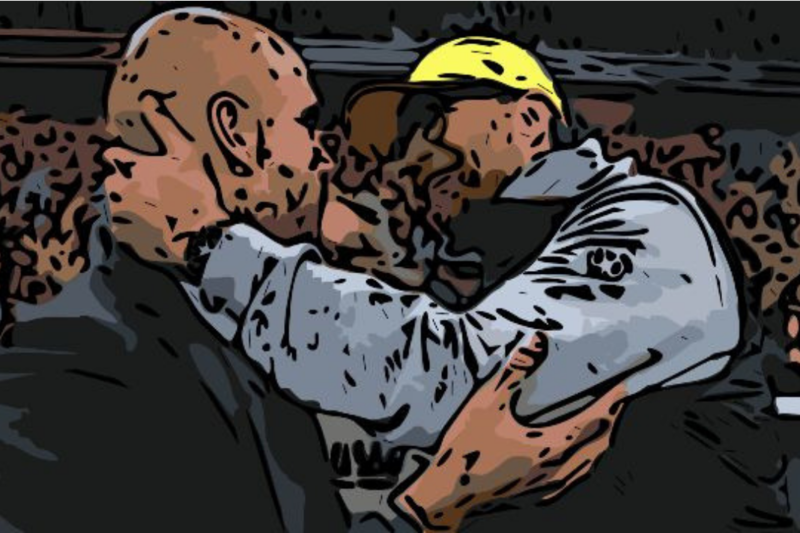 Pep’s Bayern side had won 11 and drawn two of their domestic league games so it seemed that his opening match was a blot on a perfect landscape. The two sides met in the Bundesliga in November 2013 and by this stage, it was the depth of Pep’s squad that meant his side would romp home to victory. Thiago had arrived with Pep and Mario Gotze had defected from Dortmund, thus strengthening a pretty tight squad. It was Germany’s number one who denied Dortmund many times as they broke on the counter-attack. On 54 minutes Mario Gotze was brought on in place of Mario Mandzukic and 12 minutes later he scored from a precision pass from Thomas Muller. Both Thiago and Muller added goals to ensure victory. Pep was happy to avenge defeat to ”the best counter-attacking side in the world”. Klopp knew his tactics were quelled and conceded victory with class. With one victory apiece it’s game on. Pep was wowing the Bundesliga. With 19 consecutive victories, his Bayern side were already champions in March. When Klopp brought his team to the Allianz Arena he must have smelt the fear because Bayern had been defeated by Augsburg and had drawn with Hoffenheim since then. Pep needed to win but Klopp was taking no chances. He left Lewandowski on the bench as he was moving to Bayern. Henrikh Mkhitaryan was given room to open the scoring after only 20 minutes with a perfect pass from Reus. The speed of the counter-attack was fast and on 49 minutes Reus poked home Dortmund’s second goal. Young Jonas Hoffman made it three with a superb strike in the 56th minute. Dortmund had a mere 29% of possession that day but according to Klopp it was “near perfect”. I think he was right. Pep was right too. There is something about being champions so early in the season that can cause consternation. He wobbled when Barcelona were early champions and with only six wins out of the subsequent 12 games, the thought of winning the DFB Pokal final seemed a little distant. Like Pep said, you have to be mentally strong. In the 106th minute, Arjen Robben broke the deadlock and in the 123rd minute Thomas Muller doubled the score. With two wins each, this rivalry was becoming like a tennis match offering no indication of which manager would have the upper hand. The scene was set for the following season’s opener. August 2014 saw these friendly foes fire up the season with another encounter in the DFL-Supercup. The defected Lewandowski seemed to be a striker left alone as Klopp’s side ran rings around the German Champions. Henrikh Mkhitaryan struck a piledriver of a shot into the back of the net giving Dortmund the advantage. If a superhero was needed then “Spiderman” flew into action as Piszczek’s cross was converted by Aubameyang. His header was sublime and the celebration went unpunished as he donned a Spiderman mask that he had secreted in his sock. Klopp’s team lifted the cup, so a good season was on the cards as he defeated Pep once again. By this stage Klopp’s won three to Pep’s two- where is this going? It was November when Bayern hosted Dortmund. It was a lively opening with Robben being denied twice. Reus opened with a spectacular strike after 30 minutes. It wasn’t until 71 minutes that Lewandowski equalised after multiple chances. Arjen Robben struck a perfect penalty with just five minutes to go to make sure Bayern remained undefeated. Dortmund, however, were struggling as they had taken only seven points from nine games and that continued for some time until Klopp saved his team from relegation. Pep’s men were riding high and the rivalry was heating up once more with three wins apiece. The football these managers create is nothing short of poetry. The wisdom with which they work shows that you can have a respectful rivalry. Did Pep have the title sewn up by the time these two met again? The answer is no. Did Klopp have his team hovering around mid-table? The answer is yes. So when Bayern came to the Westfalenstadion in April it was Robert Lewandowski who scored the sole goal, his first return to his old stomping ground. Without many key players, Bayern played a noticeably defensive match having only six shots on goal. Struggling Dortmund managed 15 attempts. Dortmund’s season showed that they were struggling with 31 points separating the sides. It was Klopp’s management that brought them up to seventh place. It was Pep’s guidance that gave Bayern another Bundesliga title and now two consecutive wins over his fabulous foe. Klopp did the right thing and said the right thing – he conceded that Bayern played better on this occasion. This is what makes fans tune in and the respect for each other grows. Just three weeks later these two met again in the semi-final of the DFB-Pokal. It was Klopp’s last chance for silverware, who had announced that he was stepping down after seven years in charge. Lewandowski almost caused an upset but Aubameyang forced the game into extra time. It was a dream for the rivalry but a nightmare for Pep as Philipp Lahm, Xabi Alonso, Mario Gotze and Manuel Neuer all failed to score. With four wins each, they were even. If you think Klopp had a fairytale end to his time at Dortmund think again; he lost to Wolfsburg in the final. We know the story is not over. Next time I will pick up the tale in the North West of England. These colourful characters will see that some of the best football is being played in the Premier League, especially against each other. They are good for our game. I am just happy that they are good for the rivalry in my own household.